Let me start out by saying that I’m a huge fan of David Meerman Scott’s work! and read his blog, Web Ink Now, on a regular basis. I have absolutely no idea why I waited to read this book but after finishing it the skies parted, angels sang, and the meaning of life become clear to me. As you can tell I’m being a bit facetious — but only a little. I love this book for so many reasons but let me share my three favorite reasons why you should read this book. Are you just embarking on using inbound marketing and social media for your school? Are you thinking about using these techniques but can’t convince your school leadership that this is the direction you should go? If so, read this book today! Meerman Scott does a wonderful job of explaining the background and basics of inbound marketing and social media. He is able to accomplish this in a very accesible way without using “tech” or “marketing” speak. He makes the case for using these strategies through case studies and comparisons which, in my opinion, give perspective to why and how you should use these techniques to help your school. My advice to you is to purchase two copies of the book and give one copy to your Head of School to read and keep they other for you to read. Meerman Scott will help you make the case for inbound marketing and social media. 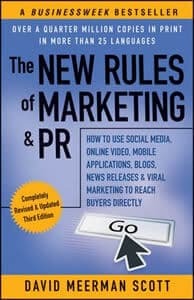 I finished The New Rules of Marketing & PR a few weeks ago and I’ve already referenced the book numerous times to review the wealth of content in the book. Meerman Scott covers SO much material it could seem overwhelming but he’s broken down each section into a series of pseudo-blog posts which not only help you to read the book but also help you to use the book as reference material. In the book he not only covers the theory behind inbound marketing but he also offers practical advice on topics like Search Engine Optimization (SEO), social media, mobile, blogs, video, news releases, podcasting, and Search Engine Marketing (SEM) to name a few. Although some of the tools he mentions might morph or change over time, the theories and advice found in this book will be relevant for a long time. As a result, this book should occupy a prime spot on your bookshelf. Although I find the other content in the book valuable, Meerman Scott’s introduction and discussion of marketing personas makes this book invaluable for me. We’ve been using inbound marketing and social media at my school for a few years now and have seen positive results. We have not however, utilized marketing personas in the past but after reading this book it is my belief that marketing personas will help us take our marketing efforts to the next level. In a nutshell, marketing personas allow us to define our prospective families and identify their problems. Once we identify their problems our marketing messages will become less about us per se and more about how to solve their problems which will help to make my school more desirable for our target families. Don’t make the same mistake that I made and wait to read this book. As I mentioned before, purchase a copy for yourself and purchase one for your Head Of School. I know that you’ll both enjoy David Meerman Scott’s work! After reading the book I would love to hear your reactions and thoughts by posting them in the comments section below. @cksyme Thanks Chris! I agree…better late than never! Awesome book. Read it, love it, recommend it. Good call. Better late than never, brother.